I usually use three or more stacked 2 x 4’s to create my curb depending on the size of the shower. Simply screw the first one to the floor (with correct non-corrosive screws), stack the next one on top and screw it down, and so on until the desired height is reached. That easy. For a concrete floor you want to use bricks. Yeah, bricks. Just stack ’em. I use gray concrete bricks (no holes) and stack them two or three high for my curbs. You can use just regular thinset to adhere them to the floor and to each other. Just stack them in the shape you want. You do not want to use wood for your curb on concrete. Wood will actually absorb moisture from your concrete and start to swell. This is one of the steps most often skipped by a lot of people – amateurs as well as professionals. It is imperative! You need it – it’s that simple. Without a pre-slope your waterproof liner will lay flat on the floor. This does not give water anywhere to go. It will sit there, stagnate, mold, . . . you get the idea. With a proper pre-slope any water will drain to the weep holes in the drain and go where it needs to – away. You need to first make sure your shower floor will stay where you put it. On wood you can use regular metal lathe. You need to place what is called a ‘cleavage’ membrane beneath your lathe. This is just a sheet of plastic or tar paper stapled to your wood floor first with the lathe placed over it. The membrane does not make anything waterproof! If someone tells you that hit ’em in the head with a bat. It is necessary to prevent the wooden floor from sucking the moisture out of the pre-slope prematurely causing it to cure too fast (or not fully) and significantly weakening it. When your membrane is down staple the lathe over the top of that. Just cut it to the shape of your shower floor and lay it flat on the floor and staple or nail it down. This gives your mud bed something to grab onto. In the above photo I have used plastic as my membrane and only have a partial piece of lathe in – make sure you cover the entire area below your pre-slope. 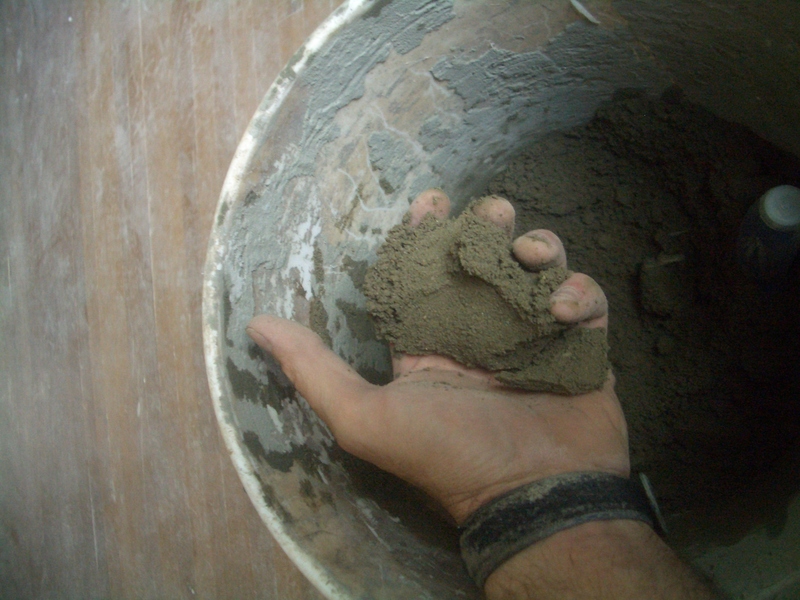 For a concrete floor you need to mix up some regular thinset except you need to mix it “loose”. That just means you need to add a bit more water than the instructions call for to make it thinner. Cover your shower floor area with this before you start installing your deck mud. The deck mud itself does not “stick” to anything, you need to supply something that will adhere it to your substrate. To make the installation easier you’ll want to mark your height lines on your wall studs. To figure out how high it needs to be off the floor you need to figure out your slope. This involves a bit of math – don’t panic! It’s easy. Figure out which corner is farthest from the center of your drain. Your slope needs to go up in height 1/4″ for every foot. 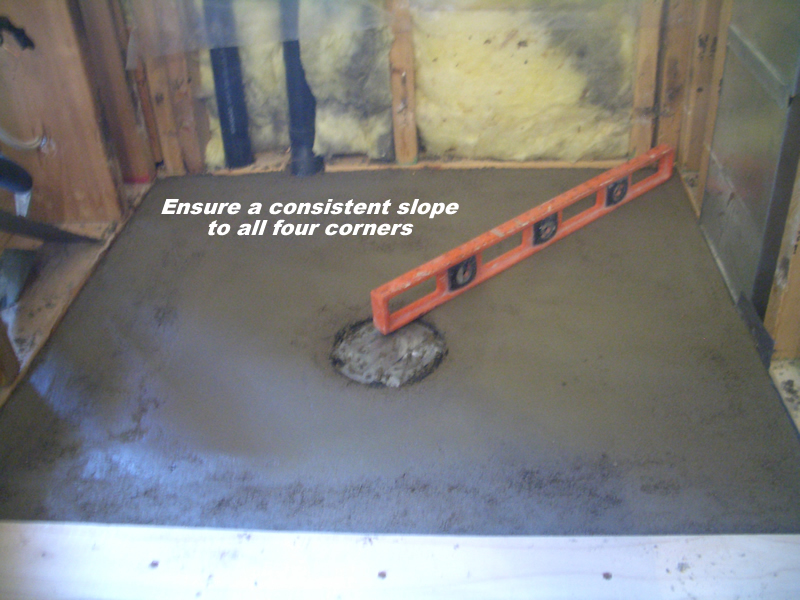 If your furthest corner is three feet from your drain center your slope needs to rise 3/4″. Easy enough so far, right? 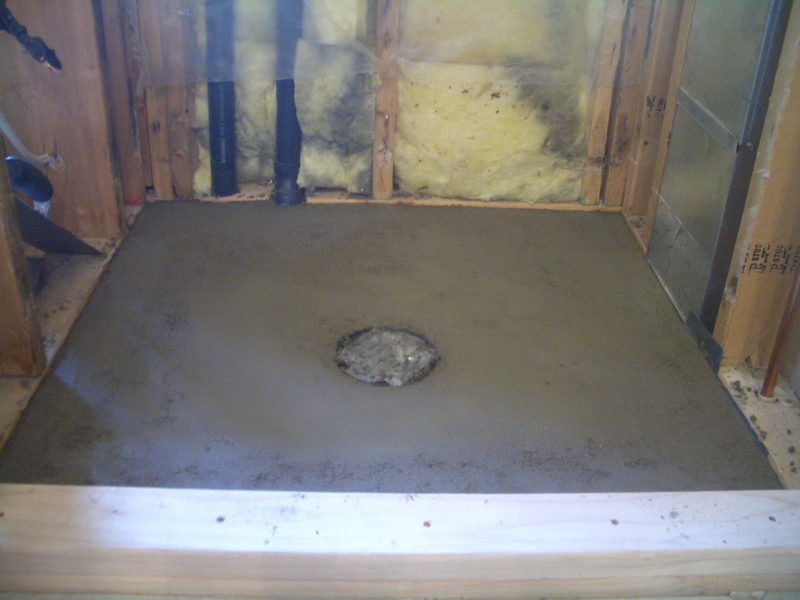 Your finished floor (after your liner and top mud bed are installed) needs to be 1″ to 1 1/4″ thick at the drain. So, if we make the pre-slope 3/4″ thick at the drain it needs to be a total of 1 1/2 inch thick at all your walls. So mark a line 1 1/2″ from the floor all the way around the wall studs. This will be the height of your pre-slope at the walls. 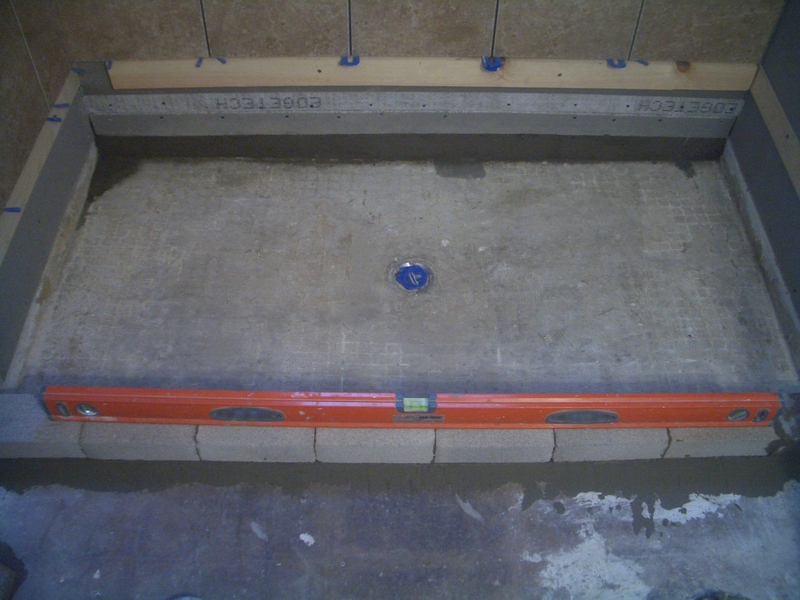 I try to make my pre-slope the correct thickness at the drain so it will be 1 1/2″ at the walls. This way you do not need to draw lines, just level your perimeter with the top of the 2 x 4 studs along the bottom of the wall. Depending on the size of the shower it doesn’t always work, but it saves time if you can work it out that way. If your shower is not a square, and they rarely are, you still need to have the same thickness at the walls all the way around the perimeter. This means that you will have a steeper slope on the walls closer to the drain. This is normal. If you don’t do it this way you will have uneven tile cuts at the bottom of your wall. By doing it this way you will ensure a level line and, in turn, a level floor around your perimeter. The height of your pre-slope at the drain can vary. It needs to be level with the top of the bottom flange of your drain. Regular drains have two flanges which bolt to each other. The pre-slope needs to be at least level or a touch higher than the bottom flange. Your liner then goes between the top and bottom flange to utilize the weep holes in the drain. This allows any water atop the liner to drain. The pre-slope supports the liner so it needs to be level or above every point of the lower flange. Does that make sense? This is why planning is so important. Your drain needs to be high (or low) enough and your curb needs to be higher than your shower floor – naturally. So figure all this out before you build anything. Now we need to mix up a batch of deck mud. Check out that link, I’ll wait . . . Okay, once your mud is mixed up you want to start packing it in there. If you are going over concrete and have your thinset slurry down, cover the entire bottom of the shower floor first to ensure the entire base will stick. If you have a large shower only spread as much thinset as you can reach over at a time. Start at the walls and pack your mud down really well – beat the hell out of it. Seriously, beat it like the last DMV employee you spoke with. You want to eliminate any voids and create as dense a bed as possible. Don’t worry, it won’t hit back. Pack it down around the perimeter to just above your line. When you get that done get yourself a 2 x 4 about 18 – 24 inches long. Lay that on top of your mud bed against your wall and tap the 2 x 4 down with your hammer until it is even with your line. This ensures a level, even line all the way around your perimeter. Perfect! Now don’t touch the edges. Continue to pack mud into your shower base all the way from the perimeter down to the drain. You should have a straight line from the perimeter to the drain without any dips or humps. This will allow water to drain correctly without pooling anywhere. While this particular layer of your shower floor does not have to be exact, you do need to make certain it is fairly flat in regards to the line from the perimeter to the drain. That’s it. When you get it all packed in there it should have a shape similar to a very, very shallow bowl. Now leave it alone. Really, leave it alone. The next day it will be ready to install your liner and all that fun stuff. Don’t play with it until then. In my next post I will show you how to install your waterproof liner. Until then leave your pre-slope alone. It’s fine. Quit trying to perfect it. We’ll do that tomorrow. Get away from it. Really. Stop staring at it . . . I just purchased one of the manuals you offer. Great information in it! Thanks! I do have a question about the shower pan pre-slope. My shower area will be about 4’x6′ with a linear drain along a 4′ wall opposite the entry (entry is on the 6′ wall. For a linear drain install, is the pre-slope the same as you describe for a standard “center” drain? As you know, even for a linear drain, it hooks into a standard 2″ round drain flange. I didn’t know if anything special was done (like one continuous slope to drain from far wall) with the pre-slope on an install like this. Thanks again. Your preslope with a linear drain will be a flat, consistent slope from the entry to the drain. This will, however, cause your bottom row of tile to ‘slope’ so you will have bigger pieces at the drain than at the entry, it follows that slope. With the drain at one end of the shower you will not have a level perimeter along the 6′ walls. Thanks! Hat was my plan, but it’s great to get a pros opinion. I’m also making the shower with a zero entry so there is no curb. Do you have any suggestions on waterproofing the entry area? 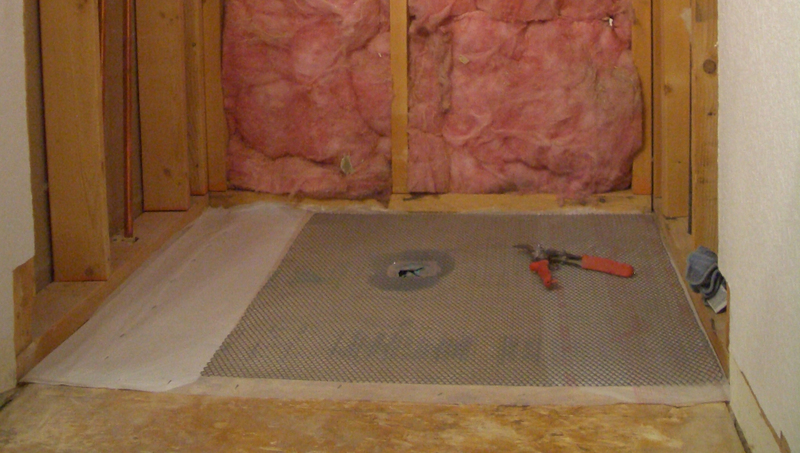 I was thinking of applying Redgard to my final slope with a fiberglass mesh tape at the transition out of the shower. I have even seen videos where the Redgard is applied on the entire bathroom floor outside the shower when a curbless system is installed. Do you think that is necessary? I don’t think the entire floor is necessary. I normally waterproof out about two feet from the entrance, that is normally plenty. Hi Floor Elf, Thanks for all the info! Just like the comment below mine, I have quite a few divots in my pre-slope. I’ve tried to fill them with more deck mud over thinset but it just balls up. Can I use regular thinset alone to fill the divots? Yes you can, provided they are no deeper than about 1/4″ or so. In my pre-slope I have a few small (1×3 inch-ish wide and maybe 1/32 or 1/16 inch deep) slopes and divets. That will mosty likely pool small amounts of water if i don’t fill them. Do i need to mix up a concrete mix or can i fill them with sand. You can fill it with sand in your preslope. Hello, I am starting the process of installing a shower (with linear drain) over a crawl space. I’ll be using 2 layers of mud with a water proof membrane in between. With regards to the drain. What is the minimum thickness of mud (1st layer) next to the drain? I’ve seen posts that say over 1 inch and I’ve seen pictures/videos where it appears to be approximately 1/4″. For a linear drain that will be determined by the height of the trough. Normally it’s 3/4″ minimum, but different manufacturers have thicker drain bases. It will be the height of the drain from the bottom to where the liner clamps into it. Hi. Where can I buy the gray concrete brick for the shower curb? I’m having trouble finding this. Also, what were the dimensions you used? Thank you! I get them at home depot. I don’t understand the dimensions question, they are 2x3x8, only one size.